This page contains additional information and an explanation of some terms used throughout the site. Why an online translation service? Can I deliver/collect the documents in person? What guarantee do I have that my money will not just disappear into thin air? Is it sufficient to translate a scan or a digital photo? How much do I have to pay extra for the translation to be posted to my address? Does it Make Sense to Pay Extra for Special Delivery? Will a translation performed by you require additional certification by a translator at the Polish Consulate? I understand that the marks will be translated into an English marking system (A, B, C, etc.). Am I right ? Will you translate my name, surname, or address? How will you translate the name of my school / university? The minimal interpreting charge equals payment for one hour of interpreting, even when the actual assignment might not last a full sixty minutes. After the first full hour of interpreting, each subsequently initiated half-hour period shall cost half the hourly rate. Example: the assignment lasted 35 minutes. The client will be charged for a full hour's work. If the assignment had lasted one hour and 15 minutes, the client would be charged for 90 minutes; whereas if the assignment lasted one hour and 35 minutes, the client would be charged for two hours' work. The assignment time runs from the moment the interpreter meets the client to the moment the interpreter is dismissed, including any travel time or waiting time while assisting the client. The standard page, in the case of certified translations (PL-ENG), contains approximately 320 words or 1800 characters of source text. An incomplete standard page shall be rounded up to the nearest half page. The source text contains 1200 characters - payment for one standard page is due. The source text contains 2400 characters - payment for 1.5 standard pages is due. The standard page, in the case of sworn translations , in accordance with the Ordinance of the Minister of Justice from 24 January 2005 § 8 item 2, contains 1125 characters of source text. An incomplete standard page shall be rounded up to the nearest half page. The source text contains 1000 characters - payment for one standard page is due. The source text contains 1300 characters - payment for 1.5 standard pages is due. The Polish format of sworn translation is unknown in Great Britain. Certified translations are used instead. Certified translations should be used whenever Polish birth, marriage, and death certificates, diplomas, insurance policies, or other official documents are to be presented to the British authorities. Each certificate contains the individual number of the translation, the translator's contact information, and a hologram sticker confirming authenticity. (See sample). Always present your translation with the certificate attached! A certified translation should be accompanied by the original document. In the Polish Republic, sworn translation is the only recognized form of certified translation of official documents. In order to become "officially sworn", the translator is required to pass a state examination, undergo a full CRB check, and maintain the highest standards of work. Sworn translators are required to keep a formal record of their work and are answerable to the Polish Ministry of Justice. 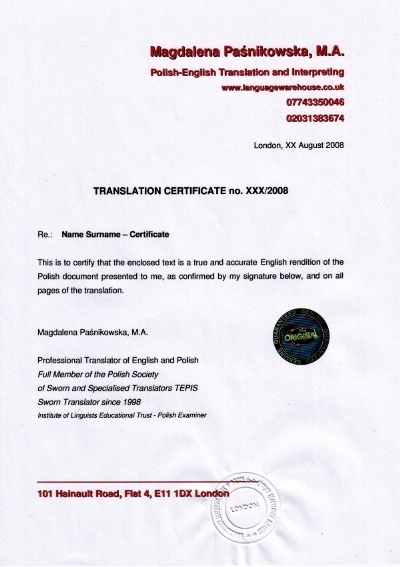 The translator uses a round seal, issued by the Polish Mint upon order of the Ministry of Justice and inscribed with the translator's name and unique identification number, to confirm that the translation corresponds to the original document. Sworn translations should be used whenever English-language birth, marriage, and death certificates, diplomas, CRB checks, or other official documents are to be presented to the Polish authorities. Sworn translation should also be used if you hold any Polish documents you wish to translate into English and present abroad, in a country other then either Great Britain or Poland, e.g. if your Polish spouse wishes to apply for a foreign visa, or you are a citizen of a third country and you wish to marry your Polish fiance in that country. In Great Britain, sworn translations are replaced by certified translations. entry in the sworn translators database held by the Ministry of Justice. (Journal of the Law of 27 December 2004) cancels the previous practice of only permitting sworn translators to work in the region of Poland where their place of permanent abode was. Translation of standard documents costs £15 each. In our understanding, a "standard document" is any official document which is in common use in the same standardised format. Examples of such documents are: graduation certificates and diplomas, maturity examination certificates, confirmation of the right to practice a given profession certificates, no impediment to marriage certificates, inquiries into the National Criminal Register and CRB checks, employment certificates, confirmation of pay certificates, birth and marriage certificates, vehicle insurance history certificates, typical, short contracts, short sworn statements, etc. To be treated as such, a standard document cannot exceed four pages. Please do not pay us before received our email quoting the confirmed price. take time to reconsider – your chances of finding employment in Great Britain by means of too verbose an effort are rather slim (in our opinion, at least). In the Polish Republic, sworn translation is the only recognized form of certified translation of official documents. Polish sworn translation executed by a sworn translator accredited at the Polish Ministry of Justice (and I am one of them) should be, according to international agreements, a universal form of translation of any document issued or presented within the territory of the Republic of Poland. Unfortunately this universal character of sworn translation is purely theoretical in the UK. In reality, the British official (insurance agent, university registrar, or other administrator) to whom you present your sworn translation often doesn’t have a clue about Poland, Polish sworn translations and international agreements. This is a bit like crossing the British border with your Polish identity card – theoretically you’ve got that right – but will the border guard know it for sure? So, to prevent any misunderstandings I also offer certified translations. To sum up – if you want to translate a Polish document (maturity certificate, graduation diploma, vehicle insurance history certificate, etc.) for the purpose of submitting it at a British office – choose a certified translation. Great Britain – order a sworn translation . I live and work in London, a huge metropolis inhabited by 7.5 million people which spreads over a diameter of almost 60 miles. Using the Internet for business is convenient just as much for me as for my Clients. Who would like to waste time driving to an actual office – even if it were located right in the centre of the City? It is obviously much more comfortable to mail a scan or a digital photo of a document to be translated without leaving one’s home – or, at the worst, to pop out to the local internet café to do this. There is also a financial aspect; considering the cost of office space rental in London, running our translation business from our living room allows us to offer you very reasonable prices. We offer online translation services. In practice it means that we work from home. This is not an appropriate place to receive Clients. Apart from that, I am often away from home on my interpreting assignments. At such times I am not even able to answer your phone calls. This is why we encourage Clients to place orders and send queries by email. We check our email accounts regularly, and always answer on the same day. I have been a sworn translator since 1998. Please have a look at my entry in the database of sworn translators at the Polish Ministry of Justice. Additionally – here is a letter from the Ministry of Justice addressed directly to me, confirming my right to practice my profession within the territory of Great Britain. Would it be worth it to risk my professional standing based on 16 years of hard work as certified and sworn translator of the English language for a dozen, or even a hundred pounds? The answer is no, never, not for any price. I would also like to note here that, depending on your manner of payment, you can use various safeguards. PayPal offers the Resolution Center, while bank cards are usually insured. Also, you are entitled to lodge a complaint against me at the Ministry of Justice. One of the payment options we offer to our Clients is paying online – by any credit or debit card, or via your PayPal account. The company which performs the transaction in our name is in fact PayPal - well known to the users of eBay and of hundreds of other online shops. The transaction takes place on a secure (https://), encoded website. Please note that the Client is not charged for using this service in any way, and that we (the LanguageWarehouse) have no access to the Client’s data whatsoever – especially their card number or their bank account details. In line with the interpretation of the Sworn Translators Act and the official guidelines to this Act, there is no formal requirement for the translation to be made from the original document for it to be deemed legally valid. In other words, the sworn translator is not a notary or an investigating officer (or an assessor for Sotheby’s art auctions). The task of a sworn translator is to faithfully, and in accordance with specified principles, translate the document presented to them – whether it is the original, a photocopy, fax, scan or digital image. British law does not place any such requirement on the translator either. The answer is short: Nothing at all. The cost of sending the translation by First Class Royal Mail is included in the price of service. In special cases, for a £5 surcharge we can use the Royal Mail Special Delivery service, whereby the delivery is guaranteed on the next working day after posting. According to Royal Mail website, First Class mail delivery usually takes place on the next working day after posting. The Royal Mail website states that 90% of all First Class mail is delivered the next working day. It is worth remembering that Royal Mail does not guarantee next-day delivery in this case. To be classified as "delayed", First Class mail must remain undelivered for over 5 working days. For a surcharge of £5.00, we shall post your translation via Special Delivery. With this option, Royal Mail guarantees delivery the next working day by 1:00 p.m. Also, using the reference number provided, you can track your mail on its way to its destination. Our experience shows that in most cases, First Class mail is quite sufficient. It is advisable, though, to use Special Delivery when you need to be absolutely sure that your mail will be delivered by a fixed deadline. I am a sworn translator of the English language listed in the register held by the Polish Republic’s Ministry of Justice, and thus I am vested with all due authority, which means that my sworn translations of your documents into Polish will not need any additional certification. I understand that my grades will be translated into the English grading system (A, B, C, etc.). Am I right? I am afraid we do not "translate" grades. Translation is not synonymous with nostrification. As a translator I am not entitled to compare two grading systems, I can only faithfully reproduce the content of the original document. The organisation set up for the purpose of conducting nostrification procedures, and for comparing various grading methods used in various educational systems with the British standard, is NARIC. Names of institutions / schools / universities: if a given institution possesses an official and generally accepted English version of its name (e.g. Ministry of Justice or University of Warsaw)- we use this version. If not - we retain the original name and add a literal translation into English. E.g. Zakład Produkcyjno-Handlowy "Wróbelek" -> Production and Trade Company "Wróbelek"
Given names and surnames are left in their original spelling. Important note: let us consider the theoretical case of a fictional person called Rafał Kuśmierczuk, whose son Paweł was just born in Great Britain. Mr Kuśmierczuk needs to translate the birth certificate into Polish to be able to present it at his register office in Poland. In the original English document his name will be spelt as "Rafal Kusmierczuk", and his son's as "Pawel". According to the rules governing sworn translation, we have to retain this spelling. If we do that - it is probable that the Polish register office will not accept the translation: "There is no such name as Pawel". On the other hand, if we change the spelling to "Paweł" in the translation, this translation will cease to be identical to the original document and as such, may not be accepted either. We solve this dilemma by writing the following: "Rafal Kusmierczuk [according to the Client's statement, the correct spelling of this name is "RAFAŁ KUŚMIERCZUK" - translator's note]. This solution is consistent with the Sworn Translator's Code of Conduct, and widely accepted by Polish authorities. Therefore, if you wish to have a birth or marriage certificate translated from English to Polish, please inform us of the original, correct spellings of names and surnames in the document. Names of institutions / schools / universities: if a given institution possesses an official and generally accepted Polish version of its name - we use this version. If not - we retain the original name and add a literal translation into Polish.